Adding value to your home is a big reason why homeowners look into bay or bow windows. Well, besides the incredible look that they provide, bay or bow windows also provide efficiency, storage, and other benefits that you won’t get with a traditional window. Fort Collins Windows & Doors offers bay window replacements for homeowners and business owners throughout Northern Colorado. Increased space in your home. Bay or Bow windows, whether they are floor to ceiling, or have a seating area built in, can add a small amount of square footage to your home. This can help with resale if you are looking to move. Brings in more natural light than other windows. Because Bay windows are pushed out, the panoramic style of the windows allows sunlight to creep in from all angles, allowing you to keep the light switches in the off position during the day. They provide a fantastic solution for your storage problems. Traditionally, bay or bow windows include the ability to add storage compartments for books, bedding, or anything that you can fit into medium sized spaces. When we design your bay window, we will speak with you about how to incorporate a unique storage space below your windows. Speaking of seating, bay windows can offer you extra space for seating in any room that they are present. You can the new area as a reading nook, a place to take naps, or more seating for entertainment purposes. 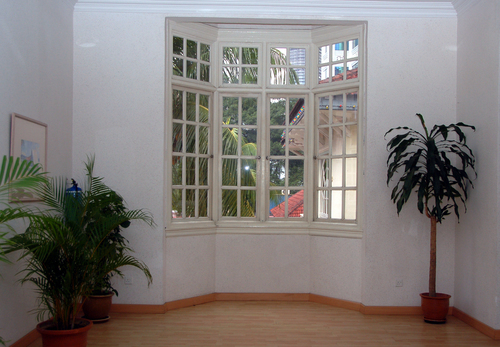 Bay or Bow windows make the inside of a room look larger. This is also apparent when looking into a home from the outside. We spoke of added square footage above, and when your guests arrive, they will feel the larger size of a room. Functionality. Traditional windows only offer the ability to move up or down, or out like a casement window. Bow windows offer different functions depending on what type of windows you want within your new bay or bow windows. Versatility. Bay or Bow windows are not restricted to just an entry room in a home. They are great for bedrooms, bathrooms, or a room looking out onto a backyard. Lastly, bay or bow windows are a great solution for a home’s ventilation problems. Because of the different angles that they offer, air can come in or escape out easily. For any questions regarding installing Bay or Bow Windows in your home, give Fort Collins Windows & Doors a call today at 970-372-5120.